In April last year we reported that the Diamond Jubilee Thames Pageant woudl set off from Putney with HRH but it appears that although the flotilla will set off from SW15, HRH and members of her family will be joining on the Spirit of Chartwell from Battersea! At high water in the afternoon of Sunday 3 June 2012, up to a thousand boats will muster on the River Thames in preparation for Her Majesty The Queen to take part in the Thames Diamond Jubilee Pageant. It will be one of the largest flotillas ever assembled on the river. Rowed boats and working boats and pleasure vessels of all shapes and sizes will be beautifully dressed with streamers and Union Flags, their crews and passengers turned out in their finest rigs. The armed forces, fire, police, rescue and other services will be afloat and there will be an exuberance of historic boats, wooden launches, steam vessels and other boats of note. This unique spectacle will provide a wonderful celebratory day for everyone in the UK with hundreds of overseas visitors expected to make the journey to London to witness this historic event. Broadcast pictures will be shown live around the world as the impressive flotilla passes down the river with bells tolling, music playing, geysers spraying and whistles blowing. The Queen will be aboard the Royal Barge which will take the central role within the procession. The pageant will be a chance for everyone to experience a glorious moment in our rich history and the atmosphere will be one of joy and celebration. It will be a day out to remember for the whole family as parks, riverbanks and bridges will become viewing positions, with extra entertainment planned for areas by the Thames. The flotilla will be bolstered with passenger boats carrying up to 30,000 flag-waving members of the public placed centre stage (or rather mid-river) in this floating celebration of Her Majesty's 60 year reign. The spectacle will be further enhanced with music barges and boats spouting geysers. Moreover, there will be specially constructed elements such as a floating belfry, its chiming bells answered by those from riverbank churches. The Thames Diamond Jubilee Pageant celebrates Her Majesty's 60 years of service by magnificently bringing the Thames to life; making it joyously full with boats, resounding with clanging bells, tooting horns and sounding whistles; recalling both its royal heritage and its heyday as a working, bustling river. When is the river pageant taking place? The afternoon of Sunday 3rd June 2012. Is the Pageant the main event of the weekend? The idea was put forward to The Queen by a Diamond Jubilee committee, led by the Mayor of London's Cultural office, that has come together to plan and organise a celebratory event to make this historic moment. There will be around 1,000 vessels making up the actual flotilla andit is expected that at least one million people lining the route and making use of the parks and public areas given over to the jubilee celebrations on the day. If you would prefer to be land-based there will be wonderful opportunities to view the procession in all its glory from prime positions along the riverbanks, supplemented by large outdoor screens showing live coverage of the Pageant. There will also be a Festival held at Battersea Park where visitors will be able to watch the flotilla as it passes by the park’s northern Thameside. The jubilee themed entertainment will be a day long programme of fun fair, competitions, games, food and cookery, storytelling, fashion and live music through the decades. How long is the flotilla? 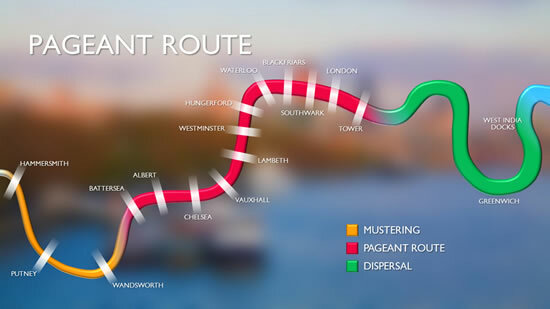 The Pageant route is approximately 7 miles (11 kilometres) long. The full route including the mustering and dispersal areas runs from Hammersmith to Greenwich Royal Naval College and is approximately 13.9 miles (22.4 kilometres). How will security be managed? Security is absolutely paramount. All the relevant security bodies are involved at the very highest level to ensure the safety of The Queen, the participants and the public. Who is paying for the River Pageant? The costs for the River Pageant will be covered by the Thames Diamond Jubilee Foundation. The Foundation is a privately funded charitable trust which aims to raise funds for charitable projects that have a link to The Queen and her Diamond Jubilee, with a particular focus on areas such as the Commonwealth, youth and education, as well as supporting the wider charitable sector. What sort of boats will be involved? Every type of vessel has been encouraged to take part - rowing boats, historic, sailing and motorised boats, kayaks and canoes. All will be decorated for the occasion. There will also be herald boats with belfries, musicians and water geysers. We will publicise details of vessels taking part in March 2012. The flotilla will be divided into ten sections with music herald barges separating each one. The Pageant’s music will be a diverse mixture of the contemporary and classical including newly commissioned pieces for the occasion. Where will The Queen be? The Queen, The Duke of Edinburgh and other members of the Royal Family will be aboard the Royal Barge The Spirit of Chartwell which will be in a prominent position at the head of the Royal section of the flotilla. The flotilla will pass under 14 road/foot/rail bridges on its journey next June. The bascules of Tower Bridge will be raised in salute. Each participating boat will be provided with a specially designed Diamond Jubilee ensign as a lasting souvenir. There are some 240 boats on the Thames licensed to carry passengers. These vessels will be encouraged to participate and will carry members of the public. The Pageant route is approximately 7 miles (11 kilometres) long. The full route including the mustering and dispersal areas runs from Hammersmith to Greenwich Royal Naval College and is approximately 13 miles (22kilometres). The flotilla will be travelling at a speed of 4 knots with the ebbing tide increasing its speed over ground to 6 knots. Vessels with sails too high to pass under London Bridge will line the river from London Bridge to Wapping creating an ‘Avenue of Sail’. There is a history of royalty using the Thames for royal celebrations in spectacular style including Anne Boleyn’s Coronation in 1533, an extravagant pageant for King Charles II and Queen Catherine of Braganza in 1662 and a flamboyant musical event held in 1717 by King George I. The Queen has launched 25 ships in her lifetime. The Queen and the Duke of Edinburgh took part in a River Progress from Greenwich to Lambeth as part of the Silver Jubilee celebrations in 1977. In the early evening on the same day a river pageant involving 140 vessels took place which Her Majesty reviewed from County Hall. The Royal Barge conveying The Queen, The Duke of Edinburgh and other members of the Royal Family will be specially created for this event and is not a new build but a clever adaptation of an existing vessel with striking decorations that are connected with The Queen and the traditions of the royal family. The lead vessel will be a floating belfry with a new set of eight church bells which will be cast at the Whitechapel Bell foundry ready for the Diamond Jubilee celebrations. The church of St James at Garlickhythe has commissioned the bells which will be installed in their church after the event. The bells will be answered and echoed by ringing from the riverbank churches along the route. 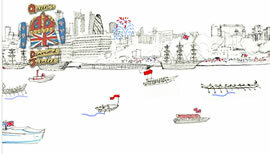 The Thames Diamond Jubilee River Pageant will be the biggest collection of historic vessels ever assembled on the Thames. One of the vessels taking part, the Amazon, also took part in Queen Victoria’s Diamond Jubilee, in 1897. Until Westminster Bridge was built in 1750 there was only one bridge crossing the River Thames, today there are many more and the Pageant will pass through 17 bridges. In the eighteenth century, the river was twice the width it is today and flowed at half the speed. At nearly 90 feet long, Gloriana will be the largest rowed vessel in the UK today.